Diet smoothies typically contain low fat ingredients and little or not sugar. If you are trying to lose weight, it is important that you drink diet smoothies as part of a balanced diet and get enough exercise. You should also not drink too many smoothies, as this will cause weight gain instead of loss. If you are not sure what to do, it’s best you consult your health care or general practitioner. 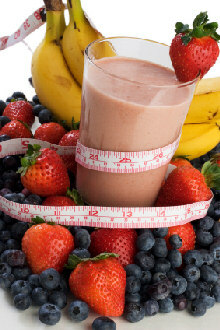 When making smoothies make use of fresh fruit, unsweetened fruit juice and fat-free yogurt and milk. Also add ice cubes or water - water is great for weight loss. You can use moderate amounts of artificial sweetener if you need to sweeten up your smoothies a bit. Feel free to send us your favorite fruit smoothie recipes with us by clicking here. We welcome your contributions. If you are new to smoothie making, we suggest that you read our useful tips in the Smoothie Recipes Guide. Put the ingredients in the order above in the blender. Blend on low speed for 30 seconds and on high speed for 20 seconds. This is also a great detox diet smoothie as it is packed with anti-oxidants. Not in everybody;s taste though. Click here if you want to submit a smoothie recipe.